Take a few minutes to interact with the applet below. Then, answer the questions that follow. Fill in the blank with the correct word: The _____________ of the blue angle is the percentage displayed. 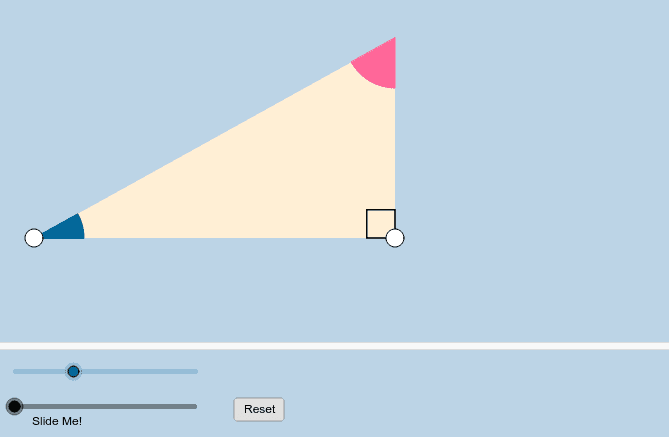 Fill in the blank with the correct word: The ___________________ of the pink angle is the percentage displayed. Thus, we can conclude that if 2 angles are ______________________ (see your answer to (1)), then the __________ of one angle is equal to the ____________________ of its ___________________ ! Notice how the first 2 letters of the last 2 blanks are the same? Why is this?